Lenders may now charge an Origination Fee up to 2.0% on GSFA Platinum loans. This change is effective immediately. The GSFA Platinum Term Sheets (Conventional and FHA/VA/USDA) have been updated and are available online in the GSFA Platinum Participant Guide. Lenders are reminded that proper documentation is essential if you are qualifying your borrower for the GSFA Affordable Subsidy. GSFA Affordable Subsidy must be entered into Page 3 Section L of the Closing Disclosure (CD). Enter GSFA Affordable Subsidy on the line directly below GSFA Platinum Grant. The GSFA Affordable Subsidy will be based on a percentage of the Loan Amount, either 2.0% or 0.5%, depending on the qualifying income. 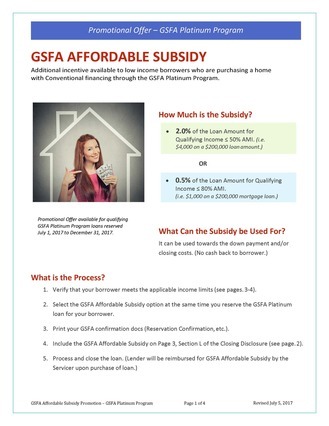 Guidelines for the GSFA Affordable Subsidy are available in the GSFA Platinum Participant Guide. distributing program updates and training announcements to the field, please forward this information. 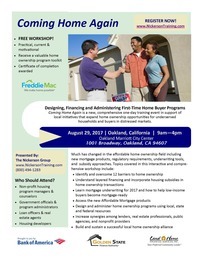 Join us at the "Coming Home Again" workshop in Oakland on Tuesday, August 29th. This new, comprehensive one-day free training event is designed to help you develop strategies and best practices for effectively meeting the needs of underserved households and buyers in distressed markets. The event is presented by The Nickerson Group and sponsored by Freddie Mac, Bank of America, Land Home Financial Services and GSFA. Seating is limited. Please register today if you are interested.